Harmony Baptist Church was constituted Friday evening, November 2, 1849. The first Baptists in the neighborhood were John Hazen and his wife Rebecca, and Nathan Hazen and his wife Lavina. They had been members of Providence Baptist Church in Beaver County. On those Sundays they were able to attend it required a day’s journey by horse and wagon to attend the morning service. When Lawrence County was formed from parts of Beaver and Mercer Counties in 1849 Harmony Baptist was organized. Nathan Hazen, an original member gave a little over an acre of land for church and graveyard, and the church-building occupied the south part of the lot. 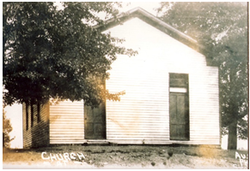 The church was organized in a school-house which stood on the west side of the road. The school house burned down and the congregation commenced building the pictured building in 1851. It was completed in 1853 and served the congregation until 1924. In 1924 a brick church building with stained glass windows was built across the highway from the old wooden church. This building served the church until 1964. By then the congregation has outgrown the building. 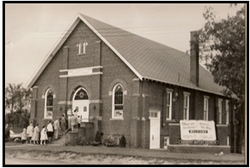 In 1964 the current building was constructed and the Fellowship Hall was added in 1988. Originally Harmony Baptist Church was associated with the American Baptist Churches but the decision was made to withdraw from the A.B.C. in 2002 and the church remains an independent Baptist Church with a world-wide missionary emphasis. Harmony, in many ways, still worships in a traditional service with a choir, organ and piano and the use of church hymns as well as newer choruses and Bible oriented preaching.